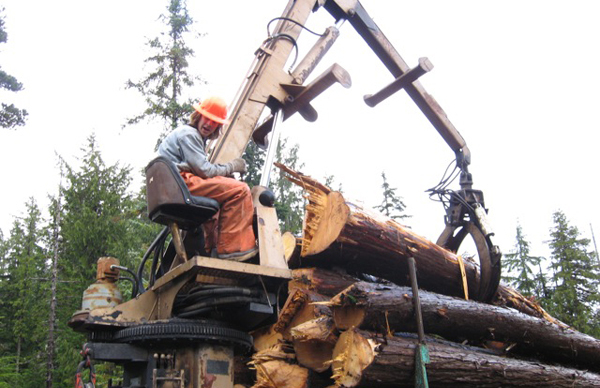 Sterling loading selectively cut Alaska Yellow Cedars. We can custom mill timbers up to 26' long and any thickness and width. Rough sawn, green timber in our three species is our bread and butter but we have provided timber to cabinet makers, boat builders and shipwrights, furniture makers, spar makers, home builders and deck builders, luthiers and artists for a wide variety of applications. Our lap siding maker allows us to manufacture re-sawn siding as well as sawn shingles. We have sold timber to the Federal Government as well as to craftsmen with a single project in mind and supply lumber yards with fine grained old growth timber for their clients. We look forward to helping you with your projects and welcome your inquiries and questions. Yellow Cedar pilings going to a remote building site. Found only on the Pacific coast of North America, Yellow Cedar is the hardest known cedar in the world. 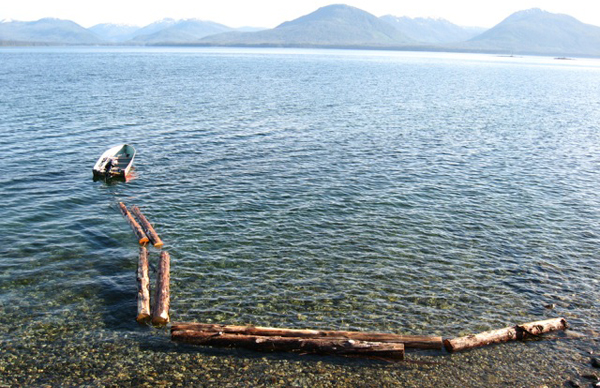 Sustainably harvested logs, hand logged from the Tongass National Forest in Southeast Alaska...exclusively from The Tenakee Logging Company! The grilling plank in action. Set of 12 - 3/8" thick x 6" wide x 13 3/4" long planks included for use on Gas or Charcoal Grills. 1. SOAK plank, weighted down completely submerged in water for at least 4 hours. Longer is better. 2. REMOVE from water and immediately place in oven at 300 degrees for 15 minutes. 3. HEAT outdoor grill to 400-600 degrees. 4. SMOKE/GRILLING place food directly on plank and set on grill, close cover; cook until done. No turning or flipping necessary. Keep a water spray bottle handy for flare-ups. Cooking time for salmon is approximately 20 minutes at 400-600 degrees. CAUTION: Planks may catch fire. Planks must be soaked in water at least four hours before every use to prevent catching fire. Use a spray bottle of water to extinguish flare-ups. Planks are for outdoor grill use only. Planks will get extremely hot during cooking. Do not remove hot planks from grill. Never leave grill unattended while cooking. Always extinguish plank in water after cooking. Caution, smoldering plank may cause fire, injury or death to persons not disposing of planks properly. Follow instructions above to prepare the cedar planks. Using boneless Salmon filet with skin - cover lightly with olive oil, pressed garlic, and fresh squeezed lime juice. Spread olive oil on top surface of pre-soaked cedar plank. 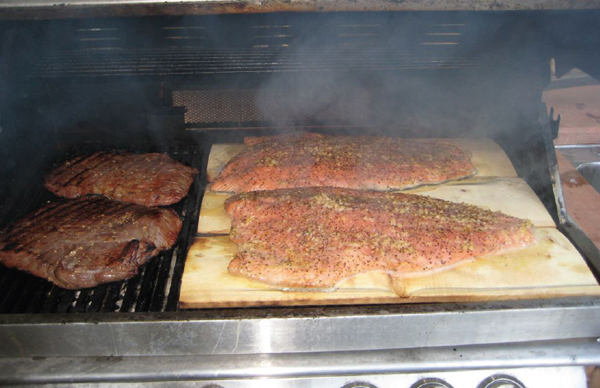 Place plank oil side up on gas grill, set salmon on top of cedar plank, skin side down. With gas grill still burning at the high setting - close cover of grill and cook for 15 to 20 minutes, until done - do not over cook. Wonderful! Rinse scallops and pat dry coat with oil and season with salt and pepper and the garlic zest mixture let sit for 30 minutes. In sauce pan, add shallot, ginger, lime juice and white wine and simmer until reduced to about 2 tablespoons. Whisk in butter 1 tablespoon at a time. Sauce shouldn't get to hot or it will separate. Add cilantro and keep warm till scallops are cooked. Cooking time will vary depending on the thickness of the scallops usually 6 to 9 minutes or until scallops are opaque. Apply sauce to scallops after removing from the grill. Soak cedar plank for 3-4 hours in water and white wine (2:1) so the plank is submerged. Marinate mahi in 2 cups wine; 1/2 cup olive oil, juice of one lemon, dash of dill, salt & pepper for 20 min. Follow instructions on front for grilling.